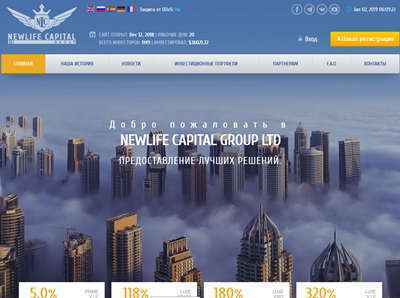 NewLife Capital Group - newlife-capital.com | Slivsell - Лучший слив инфопродуктов в России! Тема в разделе "HYIP от 16% до 60% в месяц", создана пользователем All-HYIPs.info, 2 янв 2019. 02.02.19 04:24;Account;Receive;Received Payment 2.25 USD from account U7693759 to account U1294000. Batch: 245071267. Memo: API Payment. Invoice 2078, all-hyips.info. 03.02.19 04:55;Account;Receive;Received Payment 2.25 USD from account U7693759 to account U1294000. Batch: 245172452. Memo: API Payment. Invoice 2156, all-hyips.info. 04.02.19 04:25;Account;Receive;Received Payment 2.25 USD from account U7693759 to account U1294000. Batch: 245270027. Memo: API Payment. Invoice 2245, all-hyips.info. 03.02.19 18:08;Account;Receive;Received Payment 3.00 USD from account U7693759 to account U1294000. Batch: 245238863. Memo: API Payment. Invoice 2201, all-hyips.info. 05.02.19 02:58;Account;Receive;Received Payment 2.25 USD from account U7693759 to account U1294000. Batch: 245383075. Memo: API Payment. Withdraw to all-hyips.info from newlife-capital.com , Invoice 2304. 06.02.19 03:18;Account;Receive;Received Payment 2.25 USD from account U7693759 to account U1294000. Batch: 245504988. Memo: API Payment. Withdraw to all-hyips.info from newlife-capital.com , Invoice 2381. The amount of 26.13 USD has been deposited to your account. Memo: API Payment. Withdraw to naale from newlife-capital.com , Invoice 3986.. The amount of 59.13 USD has been deposited to your account. Memo: API Payment. Withdraw to naale from newlife-capital.com , Invoice 4458.. The amount of 29.13 USD has been deposited to your account. Memo: API Payment. Withdraw to naale from newlife-capital.com , Invoice 5081.. The amount of 5.5 USD has been deposited to your account. Accounts: U7693759->U3869878. Memo: API Payment. Withdraw to hyiper from newlife-capital.com , Invoice 9644.. Date: 02:33 28.02.19. Batch: 248288075. The amount of 68.1 USD has been deposited to your account. Memo: API Payment. Withdraw to naale from newlife-capital.com , Invoice 9765..